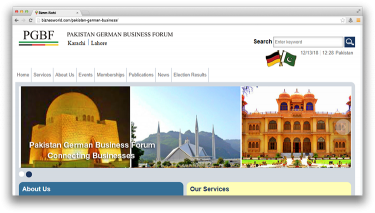 Description To encourage and promote German investment in Pakistan and vice versa and to do all things conducive for the development of Pakistan-German Business co-operation.2. To promote the development of trade, commerce and economic co-operation between the two countries.3. To foster and organize trade and investment delegations, trade fairs, exhibitions, symposiums, lectures, etc, and facilitate participation in international fairs and exhibitions in the two countries.4. Address 2nd Floor, Plot No.7-E, 9th Zamzama Commercial Lane, Phase 5, D.H.A., Karachi.